A system has 2.00 μC charges at (50 cm, 0) and (−50 cm, 0) and a −1.00 μC charge at (0, 70 cm), with a velocity in the –y-direction. 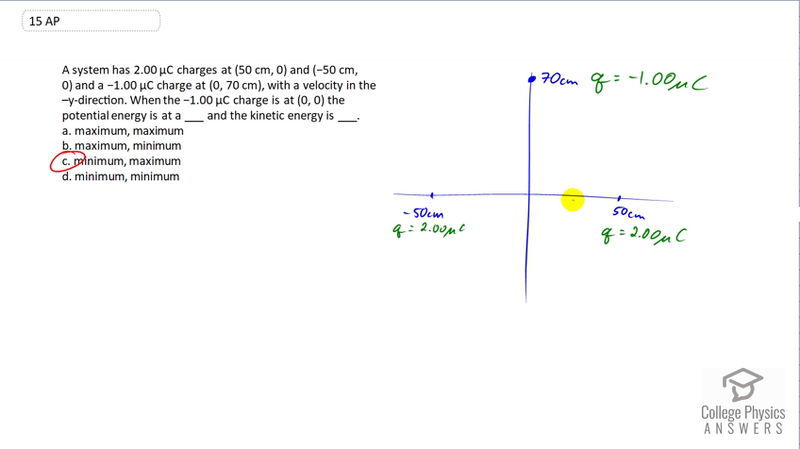 When the −1.00 μC charge is at (0, 0) the potential energy is at a ___ and the kinetic energy is ___. This is College Physics Answers with Shaun Dychko. This system has two micro-coulomb charges, one at negative 50 centimetres and other at 50 centimetres on the x-axis and then there is a negative one micro-coulomb charge on the y-axis at a position of 70 centimetres and this has a velocity downwards and the question is how the kinetic energy and potential energy change as this charge reaches the origin. So, umm… though I like to think about the potential energy as I asked how much kinetic energy could this particle gain from this position. So, the particle is here and its this far from these positive charges and its being attracted toward them and so its attracted toward each of them equally and its going to have a net acceleration downwards as a result of the coulomb attraction between these charges on the x-axis and the one moving downward on the y-axis and if you look at… if suppose this particle started in a position further away, it would be accelerated over a greater distance before reaching the origin and so this position here has a greater potential energy and so as it is getting closer and closer to the origin, each starting point closer to the origin would result in shorter distance over which acceleration would occur and therefore less amount of kinetic energy gained by the time it reaches the origin started from these positions closer and closer to the origin and so that means closer to the origin means less potential energy. It is less potential to gain kinetic energy, you might put it into those words and so the potential energy is decreasing and decreasing until it finally reaches a minimum here but this is a maximum for kinetic energy because as its been losing potential energy, that potential energy has been turning into kinetic energy as it approaches the origin and the kinetic energy is maximum and so the answer is C.